I have just discovered this wonderful site and it has brought back many many happy memories of my time at Cotteridge School from 1957-1960. Absolutely amazed and pleased to see the photo. I am the ‘footballer’ front row extreme right. Slight mis-spelling but the name should read Ian Caswell. Archie Millward is actually the one on the other side of Neil Brown behind the teacher. Archie and I are still in regular contact after 55 years! Front row far left is Richard James. My apologises for getting your name wrong (it was a long time ago!). Also apologises to Archie Millward for confusing him with another. Can you name any of the other faces in the photo? 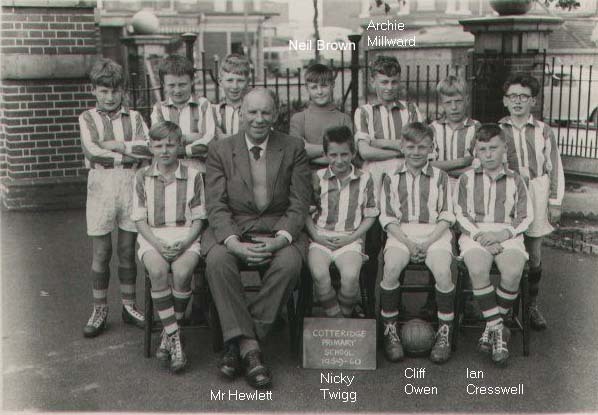 My brother is on the back row second right his name is John Smith and a friend of mine Cliff Owen is on the front row, he worked with my brother in the 70s and I am sure they do not remember being at school together. Most of my mothers family went to Cotteridge School; they were the Witherfords from Lifford Lane.